There are lots of reasons why Black Bear Cabin should be your Smoky Mountain Retreat. It won’t take renters long to discover the hot tub on the large covered front deck either:) There’s always time to relax and unwind at the Black Bear Cabin. Fixing your favorite meals is a breeze, in the kitchen or on the charcoal grill. Small families, couples, honeymooners will enjoy the quiet serenity. Sleeping arrangement: The 1st floor master suite has a private balcony, king bed, tv. Equally impressive is the adjoining master bath; hair dryer and many spa like features like a glass walk-in shower and separate footed soaking tub. Upstairs is the second bedroom - queen bed, tv, on suite bath with tub/shower combination, hair dryer. 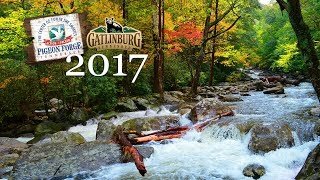 This Gatlinburg cabin rentals is new! It’s located at the end of the road too, so lots of privacy. As you pull up the driveway, notice the wooded surroundings and rolling terrain at The Black Bear Cabin - now that’s a Smoky Mountain feeling! We decorate the cabin for Christmas too! Our friendly staff at Chalet Village has 40 years of experience providing Gatlinburg cabin rentals. If you need a smaller cabin or a larger 8 bedroom lodge, we have lots of options. There is no shortage of entertainment in the Smoky Mountains too. Your not to far off the beaten path. The Gatlinburg Visitor Center and the Smoky Mountain National Park is just a short distance down the mountain. Park for free and hop aboard the Trolley for a short and scenic ride to Gatlinburg or Pigeon Forge. Some popular destinations your are close to include Mountain roller coasters, Dollywood, the Aerial Tram to Ober Gatlinburg, Ripley's Aquarium of the Smokies. Take a shady stroll through the trees, or a strenuous trek up to Mt. LeConte via the Rainbow Falls trail (pack the sturdy boots). There are several Ranger-Guided Walks & Talks. For couples: Wine tasting on Rocky Top Wine Trail, Gatlinburg Sky Lift, Gatlinburg Space Needle, Scenic Overlook, Great Smoky Mountain Wheel, Whitewater rafting on the Big Pigeon, horseback riding, a romantic picnic combined with a Smoky Mountain hike, Cades Cove carriage ride (March thru November), hot air ballooning. Surprise your partner with a fine dining experience at a Smoky Mountain restaurant Christopher Place. Since you book with us at Chalet Village, we can help your find the perfect things for couples. Gatlinburg is in the top 5 honeymoon destinations in the country! For families: Gatlinburg live music, ziplining, ice skating-sledding-skiing-Ober Gatlinburg, ride Go Karts, Dollywood is one of the top theme parks in the country, Ripley's Aquarium of the Smokies, The Island in Pigeon Forge, Titanic Museum, The Arts & Crafts Trail is an 8-mile driving loop of independent, local artisans - get your souvenir here.